Unfortunately, I didn’t really document the process of actually making the chili, so this post is going to be woefully devoid of photos. 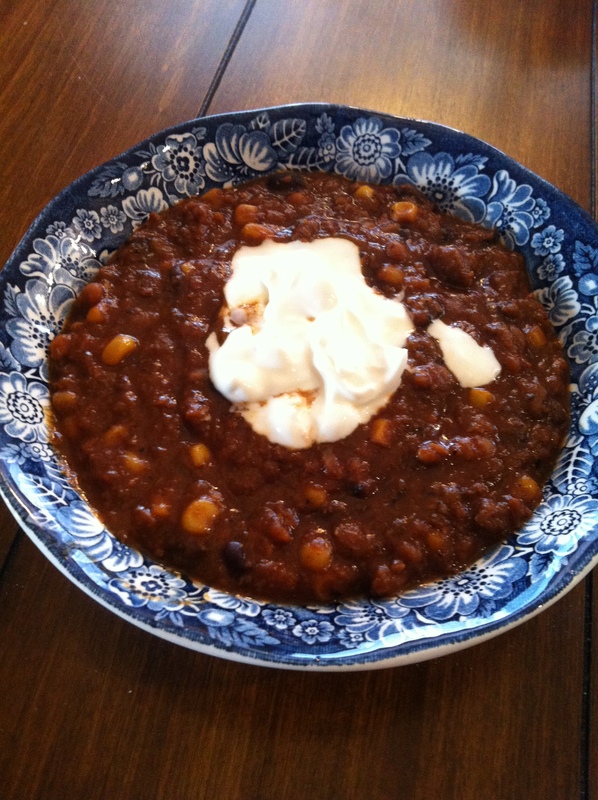 But it’s a pretty fantastic chili recipe, so I figure I need to share it with the world anyway. There’s a lot to it, so just stick with me here. Also, this is not going to be completely and utterly precise, because I tweaked and tasted A LOT as I went, as a good chili connoisseur should. So just know that you should do the same when you’re making it. Again, this is all pretty imprecise – especially the spices, obviously – but I’ll do my best to recreate. Before you start anything, pre-heat your oven to 425. Once it gets there, wrap 6 cloves of garlic in tin foil and toss it in the oven for 30-35 minutes. Roasted garlic is definitely an essential ingredient in this here chili, so make sure not to skip this step. Now, take the onions and fresh garlic, throw them in a food processor, and chop away. Again, they should be chopped very finely. Throw those into a dutch oven at medium heat, and saute. You probably want to throw some spices – garlic salt, cumin – in at this point. Honestly, you’ll probably want to spice things at most stages along the way, so just know that moving forward. Next, take your baked beans, your black beans and your crushed tomatoes and throw them in the dutch oven. 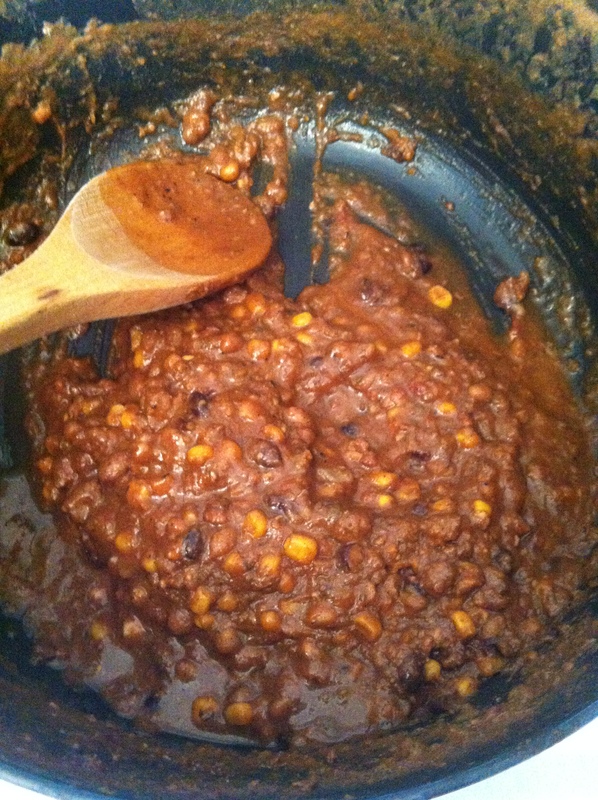 Keep it at that medium heat until you’ve got a good simmer going, and then throw in the frozen corn. Add more spices! Take your scallions and give them the same food processor treatment you gave to the onions, then saute them in a little olive oil and toss them in the pot. Add more spices! At this point your garlic should be just about done roasting, so grab it out of the oven and squeeze right into the chili. Once again, add more spices!! Keep it all simmering and stir once in a while so that it doesn’t stick to the bottom of the pan. Now it’s time for the meat. Oh, that delicious 3-meat blend. I sauteed each type of meat separately, but I don’t really think it’s necessary – you can probably just take a separate pan, toss in the beef, lamb and chorizo and go to town. But make sure to spice the meat very liberally, specifically with garlic salt, jerk seasoning and chili powder. Once you’ve browned all the meat, throw it all in the dutch oven, grease and all. Yes, I realize this is totally unhealthy. But it makes the chili special, and honestly, were you really looking for super-healthy chili anyway? Finally, pour in a can of your favorite cheap beer – the champagne of beers is my preferred move – and then just simmer away to your heart’s content and just make sure to give it a stir once in a while. Keep the chili covered when you’re not stirring. I tasted and added spices for hours and hours until I got it finally right, so don’t be afraid to tweak and tweak and tweak. It’ll make all the difference. Here’s the final product! I let this all cook over a period of about 18 hours. Chili just gets better with time, really, so be patient if you can. I have to say, it’s really outstanding chili. So try it out and impress your friends!! I promise it’ll work. Unless your friends are vegetarians, of course. More tomorrow!